This species is accepted, and its native range is Himalaya to China (Yunnan) and Central India. Berberis bussmul K.Koch ex Miq. Adhikari, B., Pendry, C.A., Pennington, R.T. & Milne, R.I. (2012). 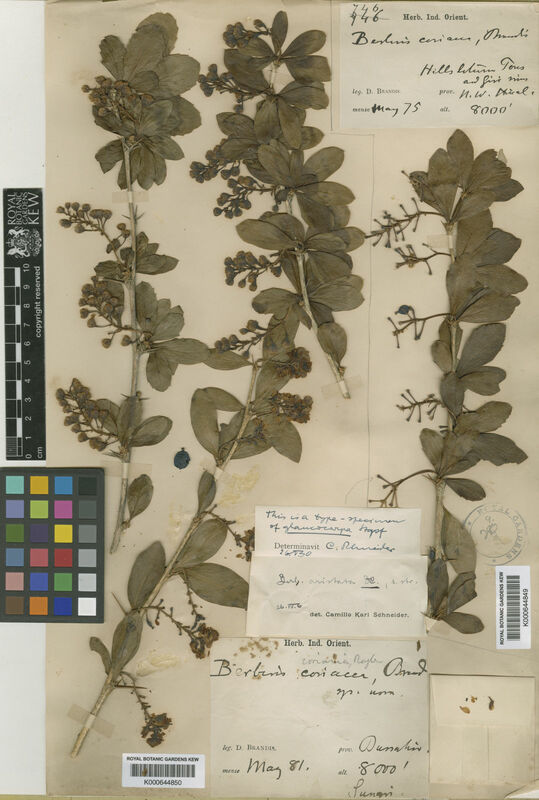 A revision of Berberis s.s. (Berberidaceae) in Nepal Edinburgh Journal of Botany 69: 477-522. Kumar, A. & Khanna, K.K. (2010). Five Angiosperms new for the flora of Madhya Pradesh Journal of Economic and Taxonomic Botany 34: 626-629.